"Overmuch sorrow yet more hindereth hope; when men think that they do believe God's word, and that his promises are all true to others, yet cannot they hope for the promised blessings to themselves. Hope is that grace by which a soul that believeth the gospel to be true, doth comfortably expect that the benefits promised shall be its own; it is an applying act. The first act of faith saith the gospel is true, which promiseth grace and glory through Christ. The next act of faith saith, I will trust my soul and all upon it, and take Christ for my Saviour and help: and then hope saith, I hope for this salvation by him: but melancholy, overwhelming sorrow and trouble is as great an adversary to this hope as water is to fire, or snow to heat. Despair is its very pulse and breath. Fain such would have hope, but they cannot. All their thoughts are suspicious and misgiving, and they can see nothing but danger and misery, and a helpless state. And when hope, which is the anchor of the soul, is gone, what wonder if they be continually tossed with storms." I'm reading Iain Murray's Heroes right now, in which he gives brief biographies of several Christians. The chapter on Whitefield focuses on Christian unity. Murray gives 3 reasons why unity fails and 5 ways to increase it. This has been challenging and encouraging for me recently. 1. Because fallen human nature is universally prone to prejudice, ignorance, and the adoption of wrong principles. 2. Because "church" in the sense of denominational organization is identified with the body of Christ. 3. Because if encounters constant opposition from the powers of darkness. 2. Let us desist, as far as possible, from controversies on secondary issues. 3. Let us be sure to recognize our own failures in this grace. 5. Let us seek closer fellowship with our savior, Jesus Christ. Well, it's been a while since I've posted anything on here - this blog has proven to be one of several things that I haven't had time to stay up with in the last few months. Hopefully that will change at some unknown time in the future. This semester has been up and down as we've been learning to adapt our lives to Cohen, all while maneuvering through school work, various physical pains and problems, and battling anxiety about the future. It's been a daily fight to trust the Lord and not to hold on the comforts we are so tempted to think we are entitled to. The Lord has been extremely faithful, answering our prayers for wisdom and patience, sanctifying us through learning to serve Cohen and one another. We've both found that we are very prone to slipping into a legalistic attitude toward God. We have a tendency to let our sin get us down, and to imagine that since we aren't displaying whatever signs of grace we think we ought to, that means we aren't r ight with the Lord, or aren't growing in our faith, or whatever. Praise God that the gospel is of free grace! I've been especially comforted lately by Zephaniah 3:17 -"The Lord your God is in your midst, a mighty one who will save; he will rejoice over you with gladness; he will quiet you by his love; he will exult over you with loud singing." It helps me to fight my tendency toward seeing God primarily as my judge, who is constantly disappointed with me and shaking his head at my sin, knowing that this verse is true for me in Jesus Christ. Cohen. Cohen has calmed down quite a bit since the first 2 months. He's on a pretty set schedule, and does quite well even when we take him out. Our favorite thing to do is put him in the baby bjorn and go for a walk. He chews on the front edge of the carrier the whole time and just makes noises. We will probably be doing that every day now that it's warming up. My birthday was on Thursday, and I decided to take the day off from work and class and do something fun as a family. We went to Clark State Forest in Indiana and walked around for a while. The weather was beautiful, and it was a really awesome day! Cohen did great at being flexible. School.After this seme ster, I'll have about 40 hours of seminary under my belt. If I stick with the current plan of taking 3 classes during the semester and one in between I can be done in 2 more years. Thankfully I've gotten a lot of the tougher classes out of the way already, so I think this is manageable, but we'll see. Future.When we think about how we might serve the Lord after seminary two possibilities are coming to our minds right now. The first is going back to China and serving as long term church planters, and the other is doing Bible translation in some capacity, probably also in conjunction with church planting. To be honest, we feel very weak and unfit for either of these ministries, and we know that there are some significant ways that we need to grow if either of these is to become a reality. Misc. I'm going to China with a group from our church in July to visit some M's and to do some EV work there. I'm really excited, and praying that God will help Megan and I through this trip to discern whether he would have us pursue going back there in the future. This is g oing to be another summer of weddings. We'll be going to weddings in Blacksburg, Virginia Beach, Baltimore, and Bluefield. It will be fun, but exhausting. My brother in law, Tom, has been promoted in the Coastguard. This is great news, except that it also comes with a transfer to Clearwater, FL. He will likely be moving in July and Christina and the kids will join him once the house sells. How great it is that everyone in our family is able to trust the Lord and his sovereign plan, even though we're all sad to know we'll be farther apart. Thank the Lord that it's his strength that sustains us to the end, because it's clear that we don't have it in ourselves. Why is God's proper name written as LORD in the OT? Is there anything wrong with saying the LORD's name, Yahweh (or Jehovah)? "(YHWH was not written according to its true pronunciation) because the Jewish people did not want the name of their God to be taken lightly, as the third commandment states: 'You shall not miuse the name of the LORD your God, for the LORD will not hold anyone guiltless who misuses his name' (Exod. 20:7).....The scribes reasoned that if they did not point the name Yahweh then it could never be treated lightly since his name would not really be known." YHWH was never spoken by Jews, they said Adonai (lord) instead. This was expressed in the translation of the Septuagint. I'm personally a fan of using a transliterated version of YHWH, even in English Bibles. The reasoning expressed in Wegner's explanation strikes me as almost superstitious, and completely missing the point of the third commandment. We say the name of Jesus, why shy away from also saying Yahweh? Most people have never noticed the difference between LORD and Lord in an English Bible, and as a result they lose something rather significant in reading the OT, and also probably miss many of the NT pointers to the divinity of Christ (Rom 10:13, Mark 1:2-3, for example). The word for God in Hebrew, Elohim, is similar to our word for God, that is, it's generic. It can mean God or god. The word Adonai (lord) is similarly ambiguous. YHWH, on the other hand, is a proper name. There is the issue of pronunciation. No one can be sure how YHWH is supposed to be pronounced because the vowels were lost along the way. I think it's safe to say that the first vowel should be an /a/ as in Father, because we have many other words in the OT that use the first two letters of YHWH and always pronounce is "Ya". Hallelujah, for example, which means praise YHWH, "Hallelu-Yah." In any case, I don't think it's a huge deal whether we pronounce his name correctly. We don't worry about it with any of the other proper names in the OT. For a people who have never heard of the Christian God, they will doubtless have their own word(s) for God/god, words that are probably as ambiguous as our word "god". I believe it is tremendously helpful and important for them to learn a specific name for the specific God who they are to worship as The God. The Chinese Bible uses Ye He Hua (transliterated form of YHWH) for YHWH and Shang Di or Shen (generic word for God/god) for God. This is the way that I'm inclined to go as well. When a Chinese person picks up the Bible and reads the name Ye He Hua they will say, "Who is this?" But as they keep reading they will learn who this God is and the name will take on definition naturally. 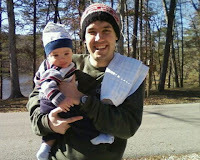 The blog has not fared well since Cohen was born - I think I'll shoot for one post a week and see how that goes. The new semester just started, and my mind is once again overloaded with all that I'm learning and thinking about in my classes. This is a wonderful thing! I'm blessed to absolutely love what I'm studying. I can't say the same was true for my undergrad. Anyway, I'm taking a class on Joel and Amos. We take the Hebrew text verse by verse, discussing both textual and theological issues. We've only had two classes thus far, and so we've just been talking about introductory matters. I want to post some thoughts about theodicy that we briefly discussed on Thursday. My professor only barely began the discussion before class ended, but I think I know where he's going. I'll find out on Tuesday. Joel chapter one is about a locust plague that strikes Jerusalem. It is catastrophic, wiping out both crop and livestock. Joel goes into great poetic detail of the destruction and devastation that the locusts bring. It's hard for us to imagine such an event, and furthermore to imagine locusts being the cause of the demise of our very livelihood. The event was much more serious than most of us probably understand when we read the text. In Chapter 2 Joel describes the invasion of Jerusalem by a foreign army, employing the language of the locust plague from chapter 1. This is likely a prophecy of the impending exile of Judah in 586 B.C. (depending on the dating of the book, which is a rather difficult task). This event is also catastrophic, bringing life as they knew it to an end. Finally, in chapter 3, Joel prophecies the last judgment, where the Lord enters into judgment with all the nations of the earth. This is the decisive and cataclysmic event of history. For those who have not bowed their knee to the God of Israel, all joy and goodness are forever lost. Each of these events is "the day of the Lord". The prophets employed a system of typology - using initial events to describe and point to future events. For example, David is a type of Christ, the exodus is a type of the salvation that is found through Christ, etc. For the inhabitants of Jerusalem at the time of the locust plague, nothing in their minds could have been worse than what they experienced. The same goes for those who lived through the sack of Jerusalem and the exile to Syria. One points to the next, and each one can legitimately be called "the day of the Lord". There will be, however, a final and ultimate "day of the Lord" with each preceding event finally points to. 4) There is no God, events are random and purposeless. If this is true, then the words "good" and "evil" have no objective meaning and the conversation isn't even worth having. Furthermore, we have no right to complain about any "evil' thing that anyone does to us, because it is simply their preference to do it. Now for what I believe is the view of the Bible. Let me preface this by saying that I believe that God's design in suffering is much more complex than this one aspect I will present. I don't mean to attempt to explain the purpose of suffering and calamities. That being said, I do believe that this is a significant one and is very important for the Christian to understand. In the book of Joel, each disastrous event points to the next, and ultimately to the final event, the last judgment. God's design in purposing disastrous events is that such events would point people to consider the last judgment, and to repent. God is completely and utterly sovereign over all things, including earthquakes, tsunamis, and genocides. His sovereignty does not remove the responsibility of humans where human volition is involved. But neither does human volition remove God's sovereignty. Therefore, whether we ourselves are involved in some life-altering disaster, or whether we simply see one one the news, the proper response is mourning and repentance. For the Christian, this morning can be followed by joyful thanksgiving that at the last judgment we will stand covered with the blood of Christ and will be welcomed into eternity as sons and daughters of God. Photo dump time! These were taken around Christmas and New Years (in no particular order because blogger makes it very difficult to organize photos on this blog!) Some of these are with Ian's family and with friends from Virginia Beach, the others are in Bluefield with Megan's family. We have many, many more pictures, and will hopefully find the time to post them all in an online album before long. Rory, Megan's brother, holding Cohen by the Christmas tree. This is what most of New Years consisted of - hanging out together, playing games, eating and drinking. Very relaxing! It was too cold to do much outside anyway. At one point Grandpa Mullennex played the fiddle for Cohen for an hour or so and he really enjoyed it. The ever-expanding Lawrence clan. Christina, Ian's sister, is holding their newborn boy, Quincy Christopher. The Rohrer's made us this awesome apron with each of their names and handprints on it. You can see Qunicy's footprints on the right. Kevin and Leslie Magee's daughter Harper trying to exert her age, size, and hand-eye-coordination on Cohen. He put up a good fight though. We called this his Elvis costume. It looks ridiculous. Megan's newly-engaged sister Beth loving on Cohen. Grammy and Cohen were made for each other! speaking in tongues nor deo we insist that everyone must speak in tongues. 1. The use of negative statements ("we refute...", "we do not use...") seems very wise to me. In order to most accurately state what you believe you have to give both positive and negative information. This is especially true in our culture where words and definitions are becoming more and more flexible. 2. I wonder how many theologians and pastors have formulated their view on the gifts of the Holy Spirit (cessationism/continuationism) having had absolutely no contact or experience with such things. Theologically speaking, one may be able to point out to a Chinese Christian why certain gifts are not to be considered the regular pattern for this age. He would likely respond by saying something like, "I have seen the sick healed, the lame walk, and numerous other Acts-like miracles, and those on a regular basis throughout my Christian experience. How shall I possibly conclude that the Bible says such things do not happen?" 3. I've read of many amazing miracles happening in rural China, and I believe what I have read, because the stories are verifies by multiple sources ("The Heavenly Man", "Back to Jerusalem", interviews with various leaders in "Inside", cited above). However, I've never heard of such things happening in the western world. Either a) this is because of a lack of faith on the part of western Christians, or b) God's plan is for unique outpourings of his Spirit to be manifested in certain times and certain places. I lean heavily toward (b). I definitely lean toward Piper's and (I think) Carson's position on spiritual gifts. The popular term seems to be "open but cautious". We'll see how that develops as I continue to study these things in the coming years. After teaching English in China for 2 years, we moved to Louisville, KY, where Ian is pursuing an Mdiv at Southern Seminary. Our son Cohen turned one in October and keeps us very busy. We love the outdoors and music, and miss the mountains of VA. God has been unflinchingly faithful to us. We rejoice in knowing Jesus and and are committed to a life of bringing the gospel to those who have not heard it.